I last made this some years ago, when Simon Hopkinson’s cookery programme was on TV. But it seems I didn’t write about it at the time, so here’s a quick post to put things right. I made it exactly as per this BBC recipe. It’s a truly delicious recipe – as you’d expect for something that includes over a pint of cream and most of a block of butter, along with a variety of interesting types of sugar, one of which I’d never used till the recipe sent me hunting for it. The recipe says “serves 4” but even someone as sceptical of serving sizes as I am would think this recipe comfortably feeds 6. The other reason this one sticks in the mind is that two years ago when I made it and photographed it and put it on Flickr, some wazzocky company took me to task for using the phrase “pudding club” in the description because they thought they owned it. Fools! 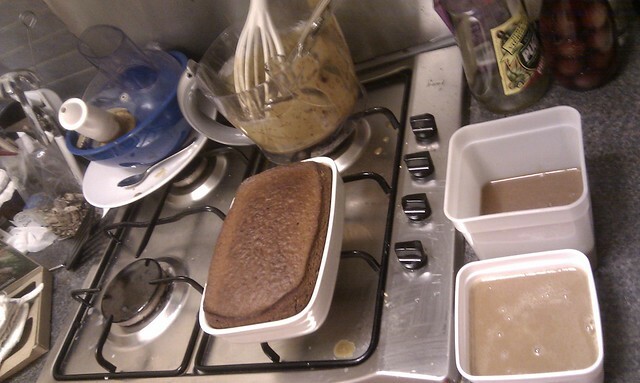 This entry was posted in Food and tagged bbc, bbc recipe, cream, dates, favourite, food, molasses, pudding, pudding club, simon hopkinson, sticky, sticky toffee pudding, sugar, toffee, tv chef.